Modi govt had announced 33% reservation for women in paramilitary forces but barely 5% of the personnel in these forces are women. New Delhi: Three years after Home Minister Rajnath Singh announced a 33 per cent reservation for women in all the Central Armed Police Forces, the forces are struggling to adhere to the affirmative action. Such is the struggle that the Central Industrial Security Force (CISF), which has a mere 5.5 per cent women in its ranks, has the best gender representation among these paramilitary forces. 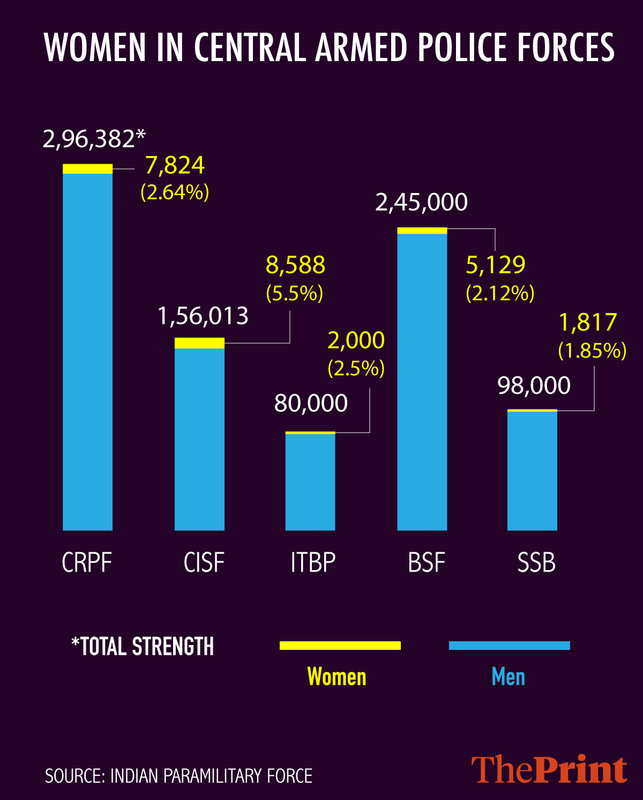 Of the 1,56,013 personnel in the CISF, only 8,588 are women. The CISF protects critical infrastructure of the country, including airports, atomic energy plants, space installations, defence production units and coal fields. The Central Reserve Police Force (CRPF), which is the largest paramilitary force in the country for law and order duties, has 2,96,382 personnel, of whom just 7,824 or 2.64 per cent are women. The CRPF personnel are posted in Left-wing extremism-hit areas and also in Jammu and Kashmir. The other forces fare no better. 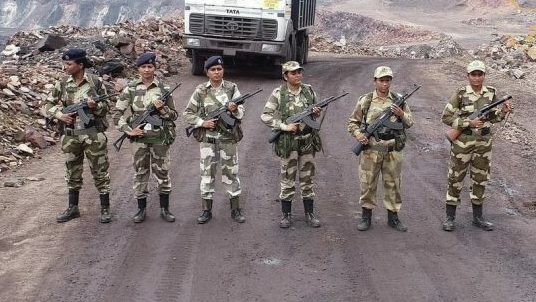 The Indo-Tibetan Border Police (ITBP), which has a strength of 80,000 personnel, has 2,000 women among them — a total of 2.5 per cent. The Border Security Force (BSF) has 2,45,000 personnel, of whom only 5,129 are women, which is 2.12 per cent, while the Sashastra Seema Bal (SSB) is the worst in this regard as it has only 1,817 women in its total strength of 98,000 personnel, which works out to 1.85 per cent. In 2016, the Modi government had decided to reserve 33 per cent posts at the constable level for women in CRPF and CISF, to begin with, and 14 to 15 per cent posts at the constable level in the border guarding forces such as the BSF, SSB and ITBP in a phased manner. Authorities at the forces now cite a lack of sufficient applicants for the poor numbers. According to a BSF officer, women do not wish to take up “hard postings” due to their “familial engagements”. Another major problem, the officer said, is a lack of privacy. A CISF officer said paramilitary forces do have forums and meetings where they discuss the need to bring in more women. Why are you giving 33% reservation only for lower post (constable). And thereby restricting them under patriarchal superior officers without giving proper work space for them. “Women Do not wish to take hard jobs”, “forces require a lot of discipline and it becomes difficult for them to manage.” – Where are these hypocritical Feminists ? What happened to the so-called “feminist” who keep talking about equality. No takers for the difficut jobs?! No so-called independent “empowered women” to take up the difficult and dangerous jobs?! Looks like these people are more interested in talking about women empowerment but lack motivation to take up the tough jobs. Let the country give women 33% quota in political party membership and M P ,M L A and other political positions. There are vast number of areas the women’s quota is to be implemented like judiciary,teaching, medical services including nursing and pharmacy etc. Without bothering for women’s reservations in the above areas what good is there in lamenting that there are no takers for women’s quota jobs in paramilitary forces? Why the quota is not restricted ministerial secretrial jobs and the like? Ye shi h k bsf me jin places pe female ki jrurt nhi h vha unki posting na ki jaye because boht se ese arises h jha pe female ko rkhne k liye accommodation nhi h or duty male k brabr krni hoti h female ki physical efficiency bhi km hoti h or bhi boht karn h jinpe government ko dhyan dene chahiye. infrastructure er bohut komiya. Nari der sorbocho pod Nari duara command Ki komi. Kash bsf me border me Nari Jis area me jorurot hay local se contract chual hone se thik hay. Subhe aya Samko wapos. Can something like clubbing 33% of the paramilitary forces be done to make a new central woman safety force like Nirbhaya Force which can deal with Woman Safety Initiative and Control of Crimes against woman . They act as a supplement to the State Police Woman Police Stations in sensetive areas of the state . I think all states have a serious man power issue when it comes to dealing crime against woman.